Chassis no. 105.33.75033109 - Engine no. The Carabo was one of the very first 'wedge' shape designs that would go on to dominate the 1970s. It is a creation of Marcello Gandini. At the end of the 1960’s Bertone focussed his creative energies on prototypes. The Turin designer’s creativity and daring reached its peak in 1968 with the Carabo, which was presented at the Paris Motor Show in October. Built on the Alfa Romeo 33 chassis with a centrally-mounted engine, it became a style classic, known for its creativity and original features, some of which contribute to its legendary standing. Design features like its tight lines, tapering front blending in seamlessly with the windscreen, and the air inlets and outlets. And the original door mechanism, with doors opening upwards and forwards (a concept which reappears on the production Countach), and even the novel colour: iridescent green like a beetle (hence the name Carabo, in Italian, a type of beetle). The result hit the headlines all round the world, and not just in the trade press, and the positive feedback was unanimous. The Carabo was Bertone’s bold but aesthetically and functionally valid vision of the sporty car of the future. And the use of new materials and novel construction techniques means that this concept car was something more than just an exercise in styling. Several of the 33 Stradales failed to find an owner and five of these were handed to the likes of Bertone and Pininfarina. 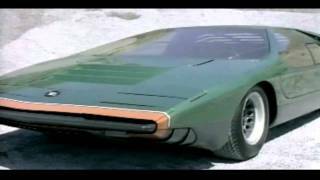 Bertone were the first to launch a Tipo 33 based show car; the Carabo.